Simplify your daily routine with a set of all-natural personal care products, each with dual uses. This less-is-more kit has you covered from head to toe. Each of the four products has two uses, so you can simplify your daily wash-up routine and your bathroom cabinet. Made with pure, simple ingredients like natural oils and beeswax, the kit includes: A bar soap designed for your skin and hair, a scrub soap for cleaning hands and refreshing dry, cracked feet, a moisturizing lotion for both palms and soles, and an all-purpose balm to soothe lips and knuckles. Handcrafted by Marit Aagard and Jeff Lovett in Pittsburgh, Pennsylvania. Each of the four products has two uses, so you can simplify your daily wash-up routine and your bathroom cabinet. Made with pure, simple ingredients like natural oils and beeswax, the kit includes: A bar soap designed for your skin and hair, a scrub soap for cleaning hands and refreshing dry, cracked feet, a moisturizing lotion for both palms and soles, and an all-purpose balm to soothe lips and knuckles. 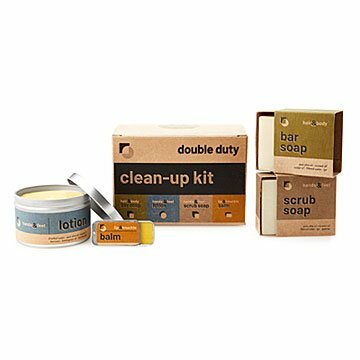 There's one place—and only one place—where you'll find the Double Duty Clean-Up Kit: UncommonGoods.